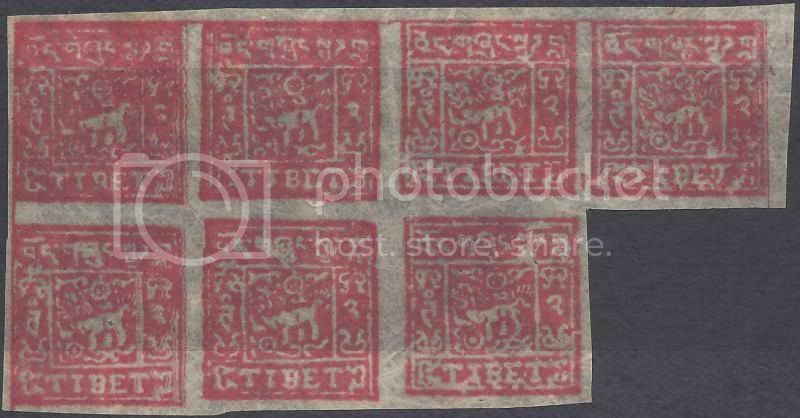 I need your help to expertise this block of 7 of 2 Trangka red imperforated whether is genuine or not? Any other information provided is very much appreciated as I am a newbie ! Is this a 1934 issue on heavy toned native paper? Thank you for your quick answer! Can you please give me a few pointers why you say that this block is fake? We can then learn from you. In addition, due to the individual carved clichés which were bound together, the space between the stamps are different. Thank you for your reply and information! I saw that the stamp in my block is quite close to stamps in your blocks. Of course the position of stamps are different in the sheet. Could this block be contemporary fake made for use at that time? One can see that it was cut for use.